It might seem hard to believe but Thanksgiving will be here soon! While it’s nice to enjoy some quality time and great food with your family, that short period after Thanksgiving when we all realize Christmas is only a few short weeks away can be stressful – especially if you’re the kind of Christmas shopper who frantically shops at the last minute. Figuring out what your family wants for Christmas can be a difficult task, but at Girls ‘Round Here you’ll find all the perfect gift ideas for your loved ones. 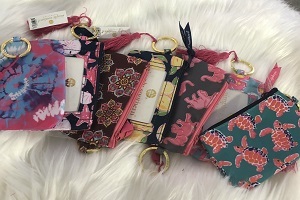 Whether you’re looking for monogrammed Charles Rivers jackets, Simply Southern Lanyards , Desden cell phone accessories, or anything in between, you’ll find it at Girls ‘Round Here! It’s never too early to start getting Christmas gift ideas, so check out our quick list of Christmas gift staples below. A perfect gift for anyone whose closet is filled with fun graphic tees, Southern Couture t-shirts come in tons of seasonal designs and colors that will have you feeling the holiday spirit. With an extensive size range from youth small to XXXL, there’s something available for the entire family. These cozy, comfortable shirts are perfect for someone who enjoys feeling comfortable and having a casual look. Holiday tea towels are a great home decor piece that will be sure to make an impression and liven up your kitchen. These tea towels have a fun spin on the 12 days of Christmas and can be personalized with your home state, including Texas, Georgia, Tennessee, and more. Mom will especially love these towels because they are the perfect piece to make her kitchen more festive. Front Porch Boutique has tons of accessories that will help you stay warm throughout the cold winter season. From warm scarves to cute, thick gloves you’ll find all of your winter accessory essentials through Front Porch Boutique at Girls ‘Round Here. They are the perfect gift for someone who’s difficult to shop for. All of Front Porch Boutique accessories are useful, practical, and stylish, even for those who are impossible to buy gifts for. A range of trendy t-shirts and other fun accessories like phone case wallets or decals that represent pride in universities like Duke, Baylor, Texas A & M, Florida State and many more! You’ll find the perfect university pride tee and at a great price, too. Products from our collegiate collection are the perfect gifts for current university students or alumnae. Simply Southern has so many cute accessories that are the perfect stocking stuffers. Simply Southern lanyards, badge reels, koozies, necklaces, or key IDs are cute and affordable accessories that always make a great Christmas gift. Who doesn’t love a great accessory? These can be for anyone, no matter what type of accessory they like, Simply Southern has the perfect options for them. This section of our website allows you to shop by state. Simply pick which state you’d like to shop and see all of the different products we carry for that state. This section is great for someone who is proud to be from their home state and loves to talk to others about it! We hope this brief list helps you out if you’re scrambling to think of last minute gift ideas. You can always browse our website at GirlsRoundHere.com for more gift inspiration or contact us by phone at 252-419-0080. We also have a Santa’s Workshop section that you can visit for some more of our favorite Christmas gifts. Whatever you need, Girls ‘Round Here is sure to have it. Visit us online, today!